One of my all time favorite places to eat would be Nobu. If you’re ever in the area of Malibu, CA or Las Vegas, NV take the time to eat there. Not everyone happens to be in the vicinity. This is a pretty close comparison. In a small saucepan, bring the sake and mirin to a boil. Add miso and whisk until blended. Add the sugar and cook over moderate heat, whisking, just until blended. Coat the fish well with your hands until completely covered. Place filets in a gallon bag. Refrigerate overnight for 24-48 hours. Preheat the oven to 400°. Heat a grill pan and oil it. Scrape the marinade off the fish completely. Add the fish and cook over high heat until browned, about 2 minutes. Flip the fish onto a heavy rimmed baking sheet and roast for 10 minutes, until flaky. Transfer to plates and serve with pickled ginger. These are great appetizers and can be made and eaten immediately or straight into the freezer for later. You can steam or pan fry them. Serve them with a ponzu sauce and enjoy. Take the salt and sprinkle over the chopped cabbage and let it stand for 5 minutes and then squeeze and remove liquid. In a large bowl mix the pork, soy, wine, cabbage, leek, sesame oil, ginger and garlic very well. 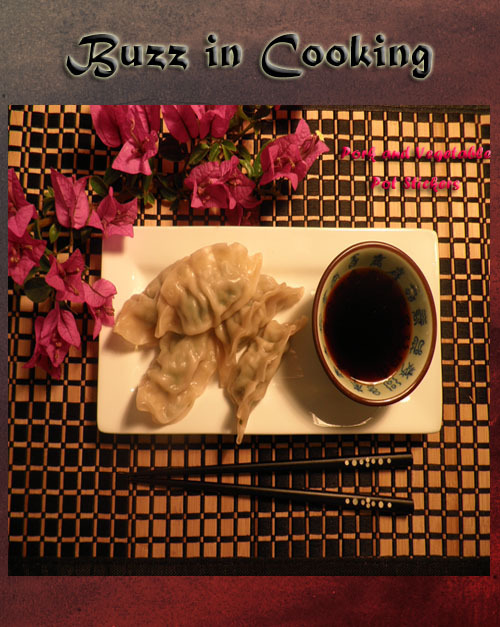 To form the dumplings, remove 1 wonton wrapper from the package, covering the others with a damp cloth. Brush 2 of the edges of the wrapper lightly with water. Place 1/2 rounded teaspoon of the pork mixture in the center of the wrapper. Fold over, seal edges, and shape as desired. Place on a baking sheet and keep moist with a wet kitchen towel. Repeat with remaining wontons until filling is gone. In a double boiler steam 8 to 10 dumplings at a time for 6 to 7 minutes. 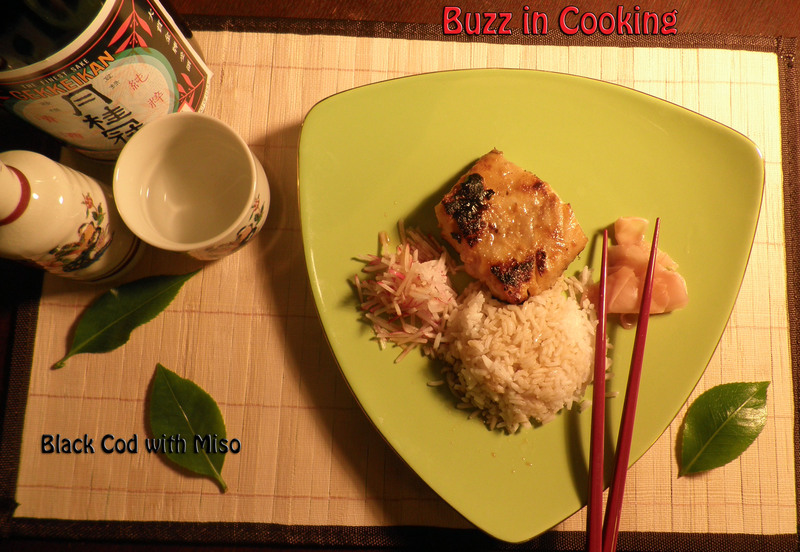 Serve steamed with ponzu sauce or allow to cool and fry in vegetable oil. Freeze any remaining dumplings and fry or steam at a later date. I just discovered the best Asian Market in the vicinity of my home and I could shop there for hours! These Wontons are a must try. Place the pork and shrimp in a food processor until they are well ground. Place in a bowl and add wine, soy sauce, and celery and mix. Pour the beaten egg to the mixture of ground pork and shrimp and season with salt and pepper. Take a wonton wrapper and fill with one teaspoon of the seasoned mixture of pork and shrimp. Moisten all 4 edges of wonton wrapper with water, then pull the top corner down to the bottom, folding the wrapper over the filling to make a triangle. Press edges firmly to make a seal. Bring left and right corners together above the filling. Overlap the tips of these corners, moisten with water and press together. Do the same with the remainder of the wraps and mixture. 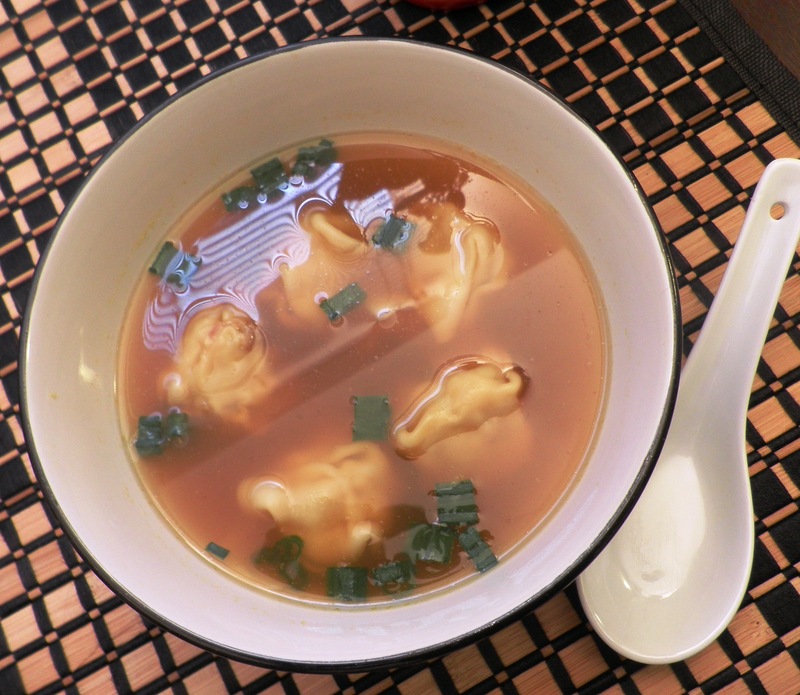 Bring stock to a boil and add the wonton one at a time and let them cook until you see them floating. Serve in a bowl and sprinkle with the sliced scallion. What a delicious way to enjoy shrimp and vegetables. Grab your chopsticks and enjoy them in a tasty Ponzu sauce. Prepare tempura batter. 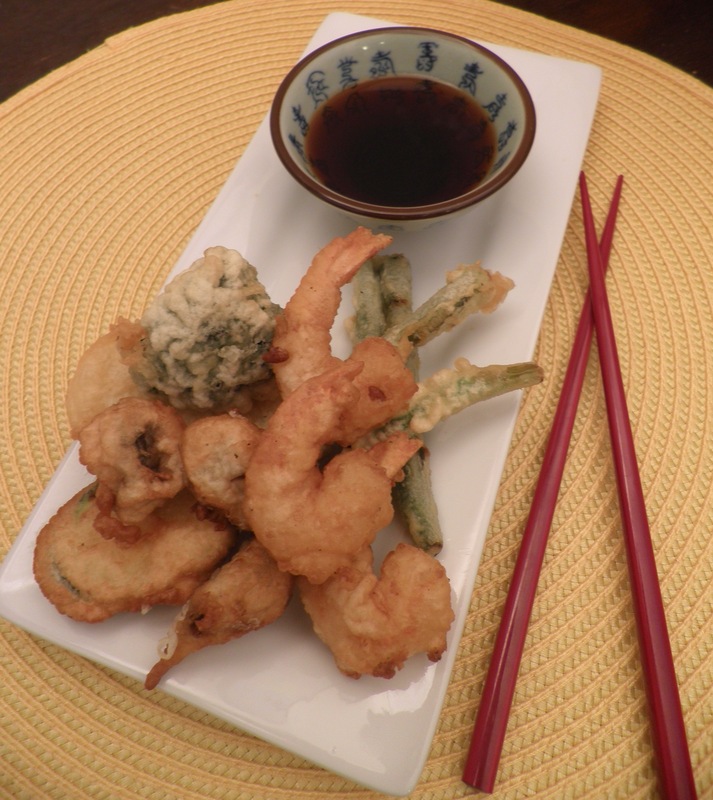 Dip the vegetables and shrimp into the batter until coated and remove with tongs or chop sticks. 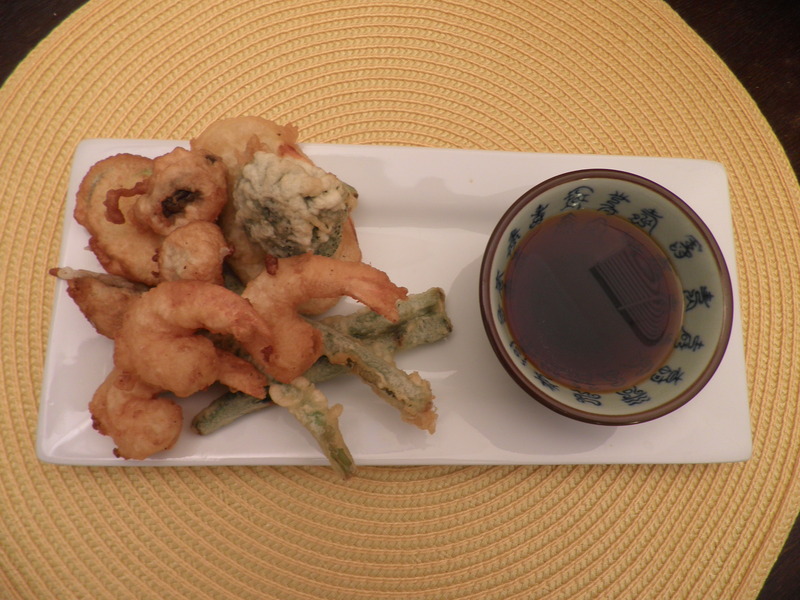 Let the excess batter drain from the vegetables and shrimp back into the bowl and deep fry in hot oil on medium high until brown and crispy. Around 2-3 minutes. Be sure not to overcrowd. Place on a paper towel. Serve immediately by themselves or a dipping sauce. Mix the dry ingredients in a bowl. Whisk the egg with the water, then stir into the dry ingredients to form a smooth batter. 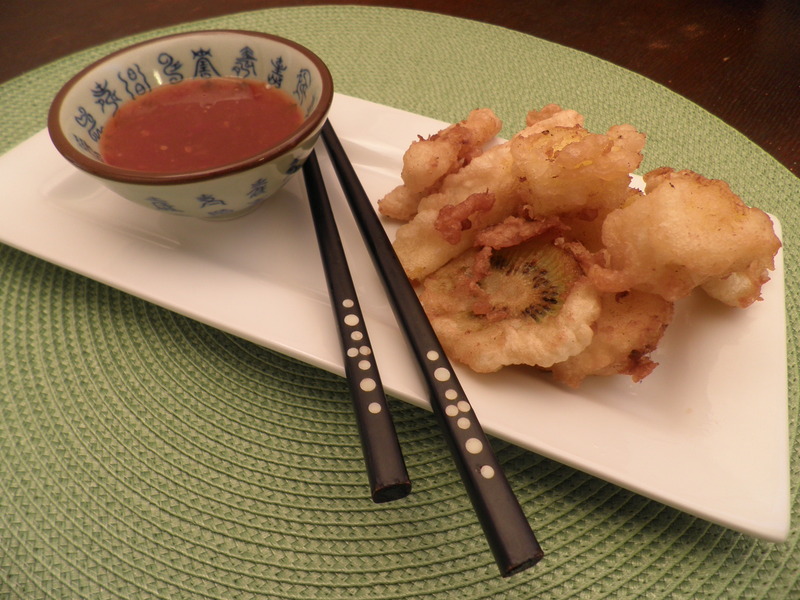 Deep-fried fruits in tempura batter are so crisp and light on the outside and sweet and juicy on the inside. It’s best to use firmer fruits like apples, pears, pineapple, mango, papaya, and kiwi. Be sure to dry the fruit before dipping in batter. Prepare tempura batter. 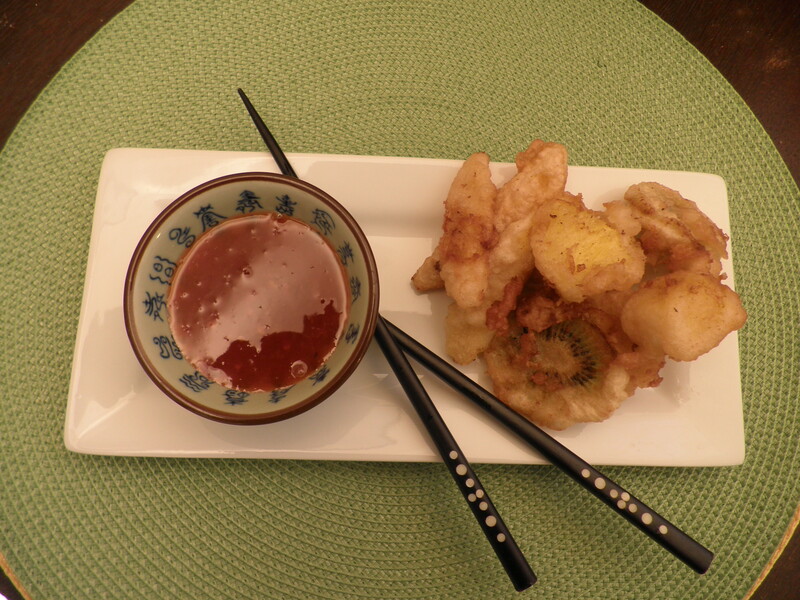 Dip the fruit into the batter until coated and remove with tongs or chop sticks. Let the excess batter drain from fruit back into the bowl and deep fry in hot oil on medium high until brown and crispy. Around 2-3 minutes. Be sure not to overcrowd. Place on a paper towel. Serve immediately by themselves or a dipping sauce.